Bio-Rad offers eleven biosimilar antibodies for research use to complement our most popular anti-biotherapeutic antibodies. Studying the biological effects of a drug or doing proof of concept ligand binding assay development for large molecule biotherapeutics, requires a source of the drug, for instance, for use in cell based assays or as a calibration standard in a pharmacokinetic (PK) assay. However, it can be challenging to obtain original pharmaceutical grade biotherapeutic drugs (also known as reference products) for research use, rather than a clinical application. Bio-Rad’s non-therapeutic biosimilar antibodies for research use avoid the need to source a therapeutic product, which can be expensive and only available in a larger quantity than needed. They enable fast and inexpensive assay development. 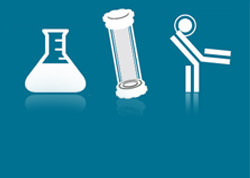 Each biosimilar research antibody has been produced using a recombinant platform and incorporates the publicly available sequence of the variable region (specificity) of the original monoclonal antibody drug. These biosimilar products are supplied in a research grade format, i.e. in PBS buffer with preservative; they are not manufactured or formulated in the same way as the therapeutic reference product. A comparison of these antibodies with their respective therapeutic reference products was carried out to show biosimilarity, Figures 1 and 2. All of our biosimilar research antibodies show comparable purity and monodispersity with the reference product. Purity was measured by band quantification of a Coomassie stained SDS-PAGE gel; monodispersity was compared using size exclusion chromatography (SEC). 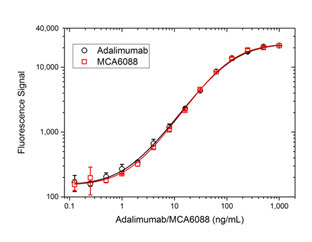 Example data for Anti-TNF alpha Antibody and adalimumab are shown in Figure 1. Detailed comparison data for each antibody with its reference product is available on the respective product information page accessed via the link in Table 1. Fig. 1a. Anti-TNF alpha Antibody (MCA6088) and adalimumab (therapeutic reference product) were denatured and analyzed under reducing (R) and non-reducing (NR) conditions. Bands were visualized using Coomassie staining. Full IgG (H2L2), heavy (H) and light chains (L) are indicated. Fig. 1b. 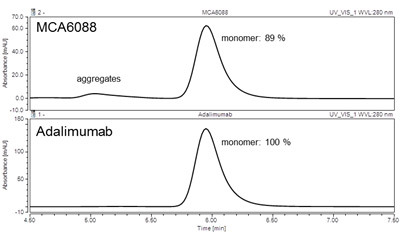 SEC of Anti-TNF alpha Antibody (MCA6088) and adalimumab was performed on an analytical HPLC instrument. Monomer peaks (H2L2), calculated relative monomer portion and aggregates are shown. Fig. 2a. Schematic image of PK Bridging ELISA. 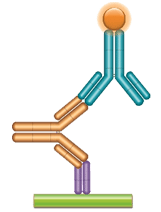 Anti-idiotypic capture antibody, Fab format (purple); monoclonal antibody, reference product or research biosimilar (gold); anti-idiotypic detection antibody, Ig format (blue), labeled with HRP. Fig. 2b. Adalimumab bridging ELISA for PK assay development. In Figure 2b, a microtiter plate was coated overnight with Human Anti-Adalimumab Antibody clone AbD18654 (HCA202) at a concentration of 1 µg/ml. After washing and blocking with PBST + 5% BSA, 10% human serum was added spiked with increasing concentrations of adalimumab (therapeutic reference product; black circles) or Human Anti-TNF alpha Antibody (MCA6088, adalimumab biosimilar research grade; red squares). 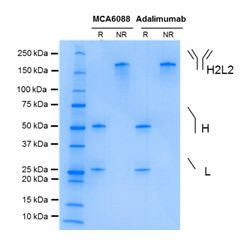 Detection was performed using HRP conjugated Human Anti-Adalimumab Antibody, clone AbD18654_hIgG1 (HCA203) at a concentration of 2 µg/ml in HISPEC Assay Diluent (BUF049A) and QuantaBlu Fluorogenic Peroxidase Substrate. Data are shown as the mean of three measurements. HRP conjugation of the antibody used in this assay was performed using a LYNX Rapid HRP Antibody Conjugation Kit® (LNK001P-LNK006P).